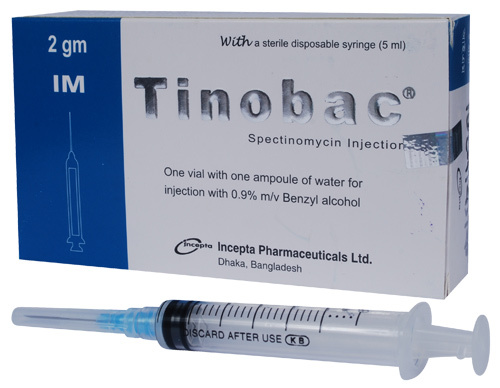 Tinobac 2 gm IM Injection: Each vial contains sterile powder of Spectinomycin Hydrochloride USP equivalent to Spectinomycin 2 gm. Tinobac Sterile Powder contains Spectinomycin Hydrochloride which is an aminocyclitol antibiotic produced by a species of soil microorganism designated as Streptomyces spectabilis. Men and women with known recent exposure to gonorrhea should be treated as those known to have gonorrhea. Tinobac Sterile Powder, 2 grams: reconstitute with 3.2 ml of the accompanying water for injection with 0.9% Benzyl alcohol. Shake vials vigorously immediately after adding diluent and before withdrawing dose. Pregnancy Category B. Since there are no controlled studies of Spectinomycin in pregnant women, and because animal reproduction studies are not always predictive of human responses, Spectinomycin should be used during pregnancy only if clearly needed.